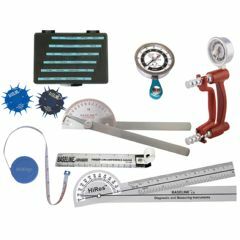 AllegroMedical.com presents The Baseline® Hand Evaluation - 8-Piece Set - Features Lite® 200 Lb. Hhd & 50 Lb. Hpg. Set of hand evaluation instruments are stored in protective carrying case. Baseline® 8-piece LiTe® hand evaluation set includes the following instruments stored in a protective carrying case: LiTe® 200 pound capacity hydraulic hand dynamometer (red), LiTe® 50 pound capacity hydraulic pinch gauge (red), 6 inch stainless steel finger goniometer, finger circumference gauge, 180 degree 6 inch plastic goniometer, measuring tape, Discim-A-Gon™ and tactile™ 5-piece monofilament set. Dynamometer and pinch gauge have a 1 year manufacturer’s warranty. CE Certified.